I don’t know a lot about sports. I grew up in family of 4 daughters and we didn’t watch TV so if we didn’t play it in school, we didn’t know about it. My knowledge of sports is as follows and this is despite the fact that I once dated a NBC sports producer and a General Manager of a large city sports arena, (not the same person and not at the same time-but I did get around in those days). The way I see it, if you don’t learn this stuff at an early age it is hard to grasp it later in life. Like a foreign language but unfortunately, there isn’t a Rosetta Stone out there to learn the sports lingo so people like me are left in the dark. Here is the sum total of my knowledge of sports. Basketball: Tall people, baggy shorts, lots of tattoos. If you close your eyes during a game all you will hear is the squeaky noises of the sneakers on the floor.You can grab and push people but you can’t get caught doing it. They show a lot of celebrities sitting court side. 4 quarters of play, a round orange ball that goes into a net on either end of the court and it ends with the NBA finals which is followed by lots of partying and drinking. Hockey: Fights, people with no front teeth, goalies wear scary masks, 3 periods of play but we leave after the 2 period to avoid traffic. Black round puck and sticks that are used to hit the puck or anyone that is near the puck. It’s ok to get caught hitting and punching and no one cares. A lot of Canadians play this game cause they are used to the cold. Not too many celebrities as it is cold in the arena. Season ends with the Stanley Cup which is followed by lots of partying and drinking. Football: Big guys, shoulder pads and helmets. Brown oval shaped ball which has to go to the end zone to win points which are called touchdowns. 4 quarters of play, big half time show to break up the monotony. Gatorade. Not too many celebrities but a lot of head traumas and broken body parts. Players can run into, crush, stomp and pull on opponents and occasionally when caught a yellow flag is thrown by a ref signaling they are busted. Ends with the Superbowl on Superbowl Sunday. This is the only sports that actually plays the final game on a specific day of the week. Sunday. Kind of like Easter. Christmas can be on any day of the week but Easter is always on a Sunday, Easter Sunday, no matter what. And that is how it is with the Superbowl, they actually have the day of the week in the name, Superbowl Sunday. Even I know that and we all know I don’t know much when it comes to sports. So there you have it in a nutshell. With so little knowledge it is easy to know what you know and what you don’t. Bob on the other hand grew up with 2 brothers and played every sport known to man. He knows stats and plays fantasy football. He knows sports. And Yet! We were out Saturday night with our oldest daughter who knows the same amount of sports information that I do when Bob asked a question that made both of us question his “MQ” the Moron Quotient, like IQ but for morons. Bob wanted to know if the Superbowl was on Sunday or Monday night. HUH? 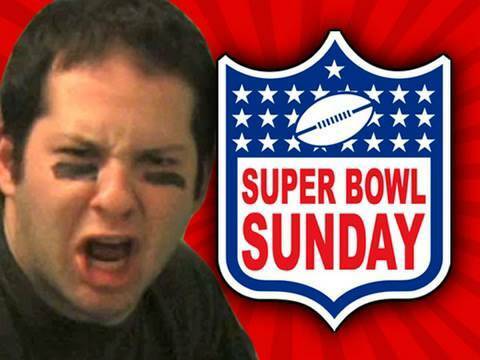 “They call it Superbowl Sunday for a reason, it is because it is played on Sunday you (moron)” we said in unison. And either unable or unwilling to recognize his faux pas, he insisted that at some point in the history of Superbowl, it had been played on a Monday night. I have never been more vehemently vocal about knowing a sports fact in my entire life. And I have never been more right-hah so there Mr. sports guy. Mr Superbowl on a Monday guy. I am going to tell everyone in your fantasy football league and you are going to be benched.